Economy Minister Nihat Zeybekci said official negotiation tours regarding the potential updates to the Customs Union Agreement with the European Union will kick off by early 2017 at the latest. 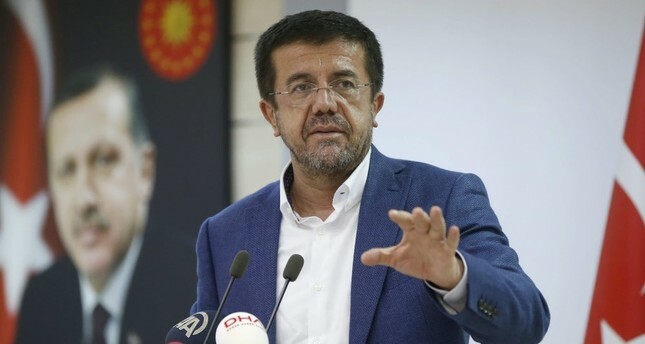 Economy Minister Nihat Zeybekci referred to German Economy Minister Sigmar Gabriel's announcement that Transatlantic Trade and Investment Partnership (TTIP) talks between the United States and the EU failed. Stating that the failure to reach an agreement in the talks did not have positive or negative effects on Turkey, Zeybekci stressed that the negotiations between Turkey and the EU regarding the updates to the Customs Union agreement are still ongoing. Noting that the process Turkey started with the EU in 2015 is currently focusing on updating the Customs Union and expanding its scope, Zeybekci said this update will enable Turkey to be automatically included in the TTIP along with free trade agreements and similar agreements signed by the EU with other countries. According to Zeybekci, it is normal for the EU to take measures and make these announcements since U.S. President Barack Obama's government will come to the end of its term by the end of the year, and if the TTIP agreement is not likely to be completed within this period, the next potential U.S. president may not have a clearly positive approach for the TTIP negotiations. Zeybekçi said everyone is trying to take a position in accordance with the newly emerging situation and the near future. Stating that TTIP agreements, which are aimed to be completed by the end of 2016, will not be completed within the said period, Zeybekci said a new process, which is likely to last until the 2020s will emerge soon, and it will not have any positive or negative effects on Turkey. Stressing that the scope of the Customs Union agreement will expand in a way to cover agricultural products, services, public procurements and investments with the potential updates, Zeybekci said Turkey will successfully manage this process, which will serve as a full integration regarding Turkey's economic relations with the EU. Pointing out that one of the main topics of the update is that Turkey will be automatically included in TTIP and similar free trade agreements, Zeybekci said impact assessment works were currently being completed in both the EU and Turkey. "We the Economy Ministry will obtain authorization from the government on this issue. EU Trade Commissioner Cecilia Malmstroem will be also authorized," Zeybekci said. "The official talks and tours will kick off in late 2016 or early 2017, and both parties have made a declaration of intention in order to speed up the process."